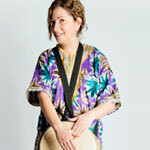 Biography Sondra entertains and enlightens her audiences with fast-moving programs on themes such as: A Tour of Africa in Story, Rhythm, and Song and Let's Make Noise. Her programs generally include music on percussion or ukulele, and she often performs with others. She has entertained at schools, libraries, and festivals for over two decades In addition to storytelling, Sondra is also an engaging musical entertainer, singing and playing old tunes on her ukulele or with percussion for all ages! Repertoire See website, www.storydrum.com Folk tales, stories, African tales, rhythm, ukulele and song.